When submerging any enclosure subsea, removal of entrained moisture in the form of water vapor is essential for equipment reliability and proper operation. The Vacuum Test Kit is specifically designed for the Subsea Engineer/Specialist to draw a vacuum on a single or two separate pieces of equipment and produce a chart paper record. 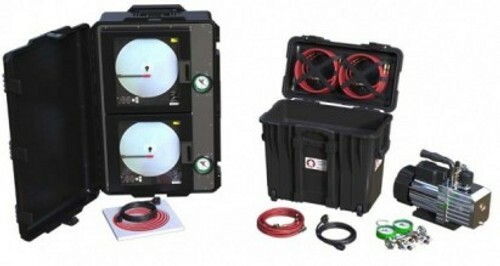 One case contains the pump, hoses and manifold with vacuum gauge, the other two independent electronic chart recorders. To learn how our Vacuum Test Kit can improve your efficiency, contact a Subsea Company representative today to arrange a demonstration.